The Customs and Border Protection has awarded four companies separate contracts worth up to $500,000 each to develop prototypes of a proposed border wall between the U.S. and Mexico, The New York Times reported Thursday. CBP said Caddell Construction, Fisher Industries, Texas Sterling Construction and W.G. 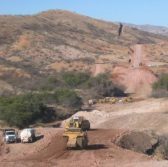 Yates & Sons Construction Company will perform work in the San Diego area over a 30-day period. “The border wall prototypes and designs will complement other tools we employ to secure our borders,” said Ronald Vitiello, acting deputy commissioner at CBP. President Donald Trump requested $1.6 billion from Congress to fund the construction of the southern border wall that will encompass approximately 650 miles of chain-link fences, steel walling and steel beams. CNN reported Thursday that CBP will test the effectiveness prototypes from each contractor in a real-world setting. The agency tasked contractors to design concrete walls that can address potential climbing or scaling over the border wall and said the project is scheduled to begin this fall.